The difference is this: Complicated speaks to the number of elements within a system, Complex speaks to the dependence, more specifically, the interdependence between two elements or among many elements of a system. So What, you might say. I am creating a nuance where one does not exist, making the whole topic, well, more complex… Let me try and explain. There is child’s game that we used to play (there are few of them that fit this description actually) where in each turn the player needs to take out one block hoping that the tower does not collapse. If it collapses, you lose. In the beginning, the blocks represent a complicated system, the removal of one element does not alter the integrity of the whole. As the game progresses however, the dependence between the elements increases until the removal of an element causes the whole thing to fall down. The system progressed from complicated to complex. Well, let’s think this from a customer journeys and customer experiences perspective. Organizations provide dozens of touch-points for their customers; in-person, phone, email, Web, Social (Facebook, Twitter, Community…) and many more. The customer experience correlates to their journey with each touch-point adding some facet to the overall experience. This could be deemed a complicated ecosystem of touch-points, take one away and the system keeps working, though not as well as it did before. Here is the problem, if you create dependencies between and among the touch-points there is a risk of the whole thing collapsing if one falls down. For example, if you use a link shortener (say bit.ly) embedded in an email newsletter that points to a YouTube video, how many failure points exist and which are in your direct control after you hit ‘send’? What about the next generation of business, a Social Business. I myself have written and talked about breaking down the silos, collaborate with others within your organization, different departments and all that good stuff. But wait, did we just alter the risk factor? Did it get better or worse. Once the silos are broken down, and their is a dependence created, there is risk, right? A manager from another department could reassign a resource or customer service is now dependent on engineering to answer a question. As organizations become less complicated, do they become more complex? What do the dependencies now created do to the greater organization, the goals and the strategy. This is not a rhetorical question, I would like some help. I have written about both collaboration and coordination, with the later more important in this context. It means simply that the interconnection points (the lines on most diagrams) are the complex things and the ones that are most important. If one of the lines is workflow, that needs careful planning and attention. If one of the lines is communication between two people, two departments or two pieces of technology make sure you understand exactly what dependencies have been created between the two elements. On the one hand, you might tightened a gap, made things more efficient, on the other hand, you might have created a risk, a single point of failure. From my vantage point, businesses have always been complicated, now they are really complex. Please share your thoughts, thanks! I am not trying to define, nor redefine – been there done that. What I am doing is to simply share how I think about things. Customer Engagement is the extent to which an organization commits, both emotionally and intellectually, to communicating and interacting with their customers, relative to accomplishing shared goals driven by customer need. Engagement can be seen as a heightened level of interaction and ownership where the company wants to do whatever they can for the benefit of the customer. Customer Relationship (Management) is the proper balance of people, process and technology; practice and strategy required to meet the customer centric goals and objectives of your business. It needs to provide all business stakeholders the data, information and insights regarding current, past and future customers (people) and the ability to interact, inform and engage (see above) with these same people. If you are interested in what led me to this, feel free to watch a short video with Paul Greenberg, and my detailed thoughts based on the video interview. What are your thoughts? To keep things balanced, should there be another word between ‘Customer’ and ‘Engagement’? Maybe Centric, Focused, Service? Without a doubt, I am a fan of Albert Einstein. 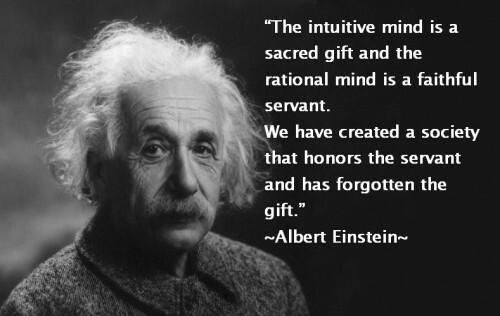 Beyond his scientific genius, his logic based approach and his stylish hair, he had a way with words. What are you doing to simplify the lives (work or personal) of your customers? Do you have a good grasp on what they want? Need? (There is a difference). An example most people can easily relate to is ‘storing stuff’. Here is the physical metaphor; As a traveler, I am looking forward to the day that when I open up my closet in my hotel room, there are my clothes for the day, exactly as they appear in my closet at home. I did not pack a suitcase, I did not drag a roller-thingy across 1000 yards from Terminal F to Terminal C at Chicago’s O’Hare. The technology example is the storage and retrieval of my work files. Fair to say that a 8GB USB key would probably do the job, but that has become a pain. Why? Well, I work on a desktop, laptop and iPad – only 2 of 3 actually have a USB port. You could also say this is a problem of my own creation (yes, but hold that thought). A few companies have started to address this problem (Apple is, again, one). Many are doing this one thing really really well. Where companies get into trouble is trying to do too much – a place they will struggle to hide the complexity. Providing a great experience (user or otherwise) is really hard, there is no doubt. The secret sauce of your offering, whatever it is, it is what you need to do better than anyone and provide great value. In general, there are at least two parts of a great experience. The remembered experience, you know the part we love, brag about (Facebook share) and thoroughly enjoy; think 2 feet of fresh powder on the slopes. Then there are parts which enabled that great experience but are meant to be forgotten; think parking lot shuttle or the high-speed chairlift. The technological version is that when I am actively using an application, buttons, and user interface are important. I want fewer mouse clicks (or none), I want simplicity, when possible, but control of my own experience, when I want it. How about the other bits, the hard things; integrated spell check, auto-save, notifications, etc.,… In theory, gone are the days that I need to worry about these things, right? But, it took a long time to hide this complexity and we all complained pretty loudly when our file was lost, or an important document went to press with a spelling error. I only remember those things, when they don’t work. Positive experiences are as much about the stuff that is memorable, as the stuff that is not. If I remember the ski-lift it is because it was a long line, a cold ride or it broke. For whatever you sell, it does what it says it does. Finally, Is it Simple to Use, Simple to Understand and Simple to Explain? I believe more people would prefer to think about the ride down in 2 feet of fresh powder, but that is just me. The intersection of, Customer Service and Social CRM is about being human, listening for signals and watching for cues. The secret sauce is understanding what you have observed and acting accordingly. On the one hand, you could call this a lesson in Social CRM, while on the other hand, you could call this being human 101. It is a bit like being married – as any man will tell you, the spousal response “I am fine” means anything but that! It is not the words, but the context, which supports my key point, cues; verbal and non-verbal add context. The ability to understand the cues and act upon them is the difference between a good and poor experience (or sleeping on the sofa). In the world of contact centers and customer service, it is the difference between good and bad customer experience. As an aside, ‘acting’ upon something can easily be doing nothing. Timing: The time of dining and/or dress might suggest that dining is not the main event. Guests: Kids at the table might suggest that speed up the service and give the dessert menu to mom. Drinks: A request for the wine menu suggests, not only that a drink is in order, but that the dining experience is might be more relaxed and casual. Are these meant to be rules? No, guidelines maybe, things to think about which can lead to a better overall experience. How does this, or can this help in the contact center? Is this only for small businesses, or large ones as well? Rigid process versus guide and adapt, sounds familiar doesn’t it. Table dynamics suggests how the waiter should act, or react. In other words, how or how not to Engage the people at the table is a critical lesson to learn, quickly as well. Given all of the talk of engagement, it is important to point out that choosing NOT to engage is an equally important possibility. Why do I believe that this could be considered Social CRM? If we believe that Social CRM is the company’s response to the customer’s control of the conversation, then it makes perfect sense. As I suggested recently, engagement is really at the behest of the customer. Choosing not to engage is an acceptable outcome, they just want a meal and to move on to their next activity. This is not a Marketing activity, this is mostly service, with a bit of sales. One point I would like to leave you with is this: Until technology can truly simulate/accurately represent looking someone in the eye when you are talking to them, technology will be just that, technology. Physical cues are lost on the phone, we can only do our best to interpret. Verbal cues are lost through Email and Social Media (excluding YouTube of course). What can else can we learn here? Whether it is intentional or not, given by pundits, professionals or proselytizers ‘advice’ is too often vague, fluffy and/or shallow. Websites, blogs and articles are filled with key words suitable for Google but lost on most humans. In the domain where I read, think and strategize; customer service, this is especially annoying. To be clear, I am not talking about those who are skilled in the one or two lines of ‘wow’, which can motivate and inject value; those I rather enjoy. The reality is that being direct is considered rude, harsh words unprofessional and honesty talked about but practiced only by convenience. We tiptoe around issues, more concerned with positioning, politics and positivity over efficiency and progress. When work submitted is unsatisfactory, we spend twice as much time trying to figure out how to say “this is really crap” in 3 paragraphs worth of ‘politeness’ as we should do. With respect to customer service, the customer is ‘always right’, however there are degrees of correctness. I am not promoting rude behavior, simply raising awareness. A Euphemism is the word or phrase chosen when the one you really need might not pass the ‘Mom test’ – you know, the ‘could I say that at the dinner table in front of mom’ word. In the business world the issue is not quite a ‘dinner table’ issue, but it does have a parallel – ‘could I say it in front of my CEO’. These are the terms and discussion topics that you try to avoid because they are too direct or contentious. Instead of saying “The server crashed” we start with “Due to…” and it ends with “…we have confidence the issue will be resolved shortly”. When it would have been awesome if only once, the answer was “I spilled my Double Mocha Super Grande on the power supply”! As companies and individuals, we are told to be transparent and authentic – which are worthy goals. But, come on, transparency is the portal to the staging environment where the view is scripted and hardly authentic. The gatekeeper is getting caught or being embarrassed into conformity (If I have high confidence I can get away with it, I will try). If we were truly being authentic, we would use the phrase “none of your business” much more often; how is that for ambiguity. When the CMOs are asked why something is done, the answer should simply be “because I want people to buy more of our stuff!” Is there really any other answer? Of course there is, but when we net it out, that is pretty close. This single phrase, the mantra of the CEO, is bandied about a lot these days, and it is becoming almost as bad the word ‘social’. Put the word ‘social’ in front of almost anything and all corporate ills are cured <hyperbole>. What exactly does getting closer to your customers mean? Does it mean listen more, talk more, sell more, Co-create or infatuate? What is the path to getting closer to your customers and the results to the bottom line? Do you want to get closer to your customer or customers? Do not answer too fast, spend a minute thinking about it. All we need to do is be customer centric, right? Social, as a descriptor, is getting in the way of progress towards actually getting closer. The reason is that it simply has too many definitions past and present. People will try to make the leap that we are able get closer to our customers by being more social. What do you think? How much about getting closer is about technology? As the size of the organization increases, technology will be involved at some level, of course. The key is to use technology to mediate the communication (or channel), not dis-intermediate the customer. If I pick up the phone or talk to my customers face to face, I will understand them better. In other words, getting closer to your customer will involve a social activity but might not involve a social technology. In the context of business, social is different from social in the high school café. Social is really about sitting down and having a drink, playing a round of golf, going shopping, being human and listening actively. The meaning of social has not changed, nor should it. Getting closer to your customer takes time, energy and patience; there is no magic bullet. I apologize if I did not give specific instructions, nor a how-to guide. You know your customers better than anyone else, consider that as you build your customer strategy and those who will advise you on how to get it done. Strategic Ambiguity is really about doing more with less, that really is a win-win. If you are an advice giver, do you have what you need to back up your claims? If you are searching for insights and are the recipient, are the pundits clear enough to pass the sniff test? Theory is Great; Solving Real Problems Rocks! Earlier this week Sword Ciboodle announced new relationship with Nicor National. We put out a press release (which is ‘old school’), and I challenged our new Public Relations team to dive a little deeper into Nicor National’s perspective regarding the selection process. Despite being an ‘outside agency,’ I consider Liz and Anne an extension of our team, so it was time well spent as the begin just their second month with us. The rose to the challenge and spent some time with the customer! Why is this exercise important? Well, let’s face it- press releases have their place, but we thought we could get a little more insight on what Nicor’s choice really means to them and their customers. After we issued the official release, Liz sat down with Barbara Porter, Vice President of Customer Service and Business Development of Nicor National to have a candid Q&A. The Questions below are direct from the conversation, my color commentary should be quite clear. Q: Before deciding to engage with Sword Ciboodle, how did you manage your customer relationships? A: We had multiple systems, about 10 or 11. It was just becoming far too complex to manage our interactions with our customers. My POV: In talking with customers and doing industry research, companies are lumping these two problems together, when they can be separated. Many companies are deciding that the transactional and data parts of many systems are just fine. It is the user experience that is becoming harder and harder to manage. Q: What was the moment that really signaled it was time for Nicor National to change? A: Our processes just weren’t customer friendly anymore. It was difficult for both our reps and customers and once that became very apparent, we knew we needed toexplore other options. My POV: Putting the customer’s needs at the center of an infrastructure change can be an uphill battle. The ROI can be difficult to measure – possible, but not easy. Doing right by the customer always makes sense – period. Q: What made you decide to select Sword Ciboodle? A: We actually met Sword Ciboodle at a conference. We realized quickly that the team had great experience in our industry and truly understood our business at ahigh level. That’s just as important to us as the technology. My POV: It is refreshing to hear a comment like this – for one, that the world of Marketing cannot simply be solved only using “Inbound” approaches. Business still takes place between people, in person, where you can shake hands and discuss business over lunch. Q: Are you exploring other methods of engaging customers such as through social media channels? A: Yes! Our customers have been indicating they want this more and more, particularly to communicate with us in general, pay bills, check their status and other areas that help maintain their relationship with us. We currently use a system called Allegiance to create customer surveys, as well as receive direct feedback from customers. We are hearing more and more from them that they want social functionality. My POV: This is fun to hear and interesting at the same time. Those of you who know me, well ‘commentary’ will simply not cut it. I will try to schedule more time with Ms. Porter and dig in a bit more on this one. Q: Anything else you think people should know? A: All along our focus has been to create a positive experience for both our staff and customers. The two go hand-in-hand. We know Sword Ciboodle is going to help us deliver on that commitment. Once the program is entirely rolled out and themultiple systems are gone, it’s going to be fabulous! Here is a link to the ‘old school’ release. Will we continue to issue press releases? Yes, because there is still value in sending them out, people do read them – I am told. Is Twitter a Customer Service Platform, Protocol or Channel? Twitter is an interesting beast, that is for sure. I am sure a few (or more) will suggest that it is none of the above. Or, better, that it is a monumental waste of time. The nature of Twitter is that everything is open for the world to see, that does beg the question of how best does Twitter fit into your Customer Service processes? Some of the challenges are actually a bit technical in nature; Twitter is actually a Service Platform*, which acts like a Protocol, and should be treated like a Channel. In order to get there, maybe a little bit of review is in order. My review is timed for an event, close to home, where JetBlue and Comcast are planning to present to a small group here in Burlington, VT. The interest lies in the fact that by one measure, JetBlue is considered tops in Loyalty, yet are almost 3 times as likely (as the baseline) to see a negative experience show up on Twitter. The need to broadcast a problem to the world would not be necessary if the customer had confidence that their issue would be solved timely and to their satisfaction. Regardless of whether or not it is a good customer service platform, customers are taking their issues social and they can’t be ignored. Any channel a customer chooses to contact an organization is a channel the organization should be listening on – or have a clearly stated and well-known reason not to (example: you cannot contact your broker about a trade via email due to latencies)…. Despite the novelty behind it Twitter remains a simple channel you add to your lineup of channels to serve customers. If you understand the basic rules of engagement for the channel, and how to deliver value best (e.g. tweeting the answer in 14-consecutive-tweets versus posting a link to somewhere) to your customers, then you should be able to deliver against those expectations – after you set them at the right level. As noted above, Twitter is not a Customer Service Platform – it is only part of a Customer Service Platform, maybe. That does not mean people do not use it as such. Coca-Cola is not billed as a rust removal system either, just saying. Some believe that Twitter should be an open protocol, but that is not likely to happen either. Therefore, a channel of communications is what is left, that is what Twitter is, and how it should be treated. This does not take anything away from it, just calling it like I see it. Your customers are there, and therefore you need to be there as well. Some old rules are broken though, unless I am missing something important. For example, if JetBlue has that many negative issues, then their loyalty number could not be that high if it takes “12 good things for every bad”. The follow-up question is how well is this (or any) channel is integrated into the rest of your customer service processes? According to some recent research (Brent Leary analysis), 35% of companies surveyed said “Yes” when asked “Is your social media/social networking fully integrated into traditional customer service problem-resolution processes?” I need to be direct and question that particular statistic, as I have yet to run into many (any?) companies at all where the processes are truly integrated from end to end. The simple point is about a technical challenge or limitation, your customers will know if they systems are integrated, or not. Even so, 65% of companies recognize that social is not integrated, therefore each is an island of process and of information. Your customers deserve better than this, no? I spend a lot of time thinking rhough these types of issues for Sword Ciboodle and our customers. (*For the technical minded in the group, Twitter seems to be tending towards a service, offered by a private company, as a 3rd parties can typically build on top of a platform, but those rules seemed to be changing as well (who can and will make changes)).